Many forensic samples would be impossible to analyze if it weren't for the advent of the polymerase chain reaction (PCR). Most forensic samples are limited in their quantity as well as quality of DNA. PCR allows scientists to make billions of copies of DNA from a minute amount of starting material. PCR is sensitive and rapid enough to allow limited quantities of DNA to be utilized. PCR - often referred to as 'thermo-cycling' - targets a specific sequence of genetic material and creates copies of said sequence. This process involves the cycling of heating and cooling steps. These steps include the raising of the temperature to cause DNA to become single stranded (denatured), lowering the temperature slightly to allow specific fragments of DNA used for copying to attach to the single strands (annealing), then one last temperature adjustment so the DNA may be copied (extension). Typical PCR reactions will run this set of temperature adjustments (or cycles) approximately 28 times. The amount of DNA contained in the test tube will double with each cycle. If a sample were to start with a single copy of DNA from one cell, after 28 cycles and the amount of DNA doubling each time - there would be 134,217,728 copies of DNA present in the sample tube. Luckily, most forensic type samples start with more than one cell - and more than one copy of DNA after extraction. Therefore, the number of copies of DNA would be much greater than 134million - and instead, would have copies in the billions. The fragments used during the annealing phase of PCR (which are called "primers") are highly specific towards certain regions of human DNA. 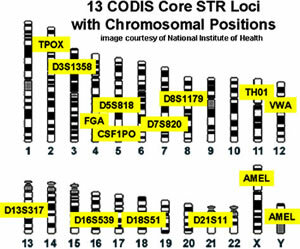 In forensics, only specific sections of the human genome are copied (or amplified) - these sections are commonly referred to as the "13 CODIS Core STR Loci." An STR - or Short Tandem Repeat - contains a repeated sequence of genetic code. For example, a person's genetic profile might consist of three repeats (ATG ATG ATG) within a one region and five repeats at another region. The primers used in PCR are color coded in such a way so that analysts in a forensics facility can distinguish between both the location in the genome the copy came from as well as the size of the fragment - or the number of repeats. Thank you to the DNA Learning Center for this animation.